The three weeks of the Giro D’Italia will bring many thrills and spills with it over the next twenty one days but with the pink jersey out of the range of so many riders – a comment that applies for other classifications too – some newcomers can feel a little short of action over the coming three weeks. The head to head markets, however – where two riders are pitched against eachother over the three weeks, with the fastest overall time winning – can provide a thrill or two for cycling betting fans, regardless of whether they have single or accumulator bets. Here are a couple of suggestions for three-week head to head wagers. 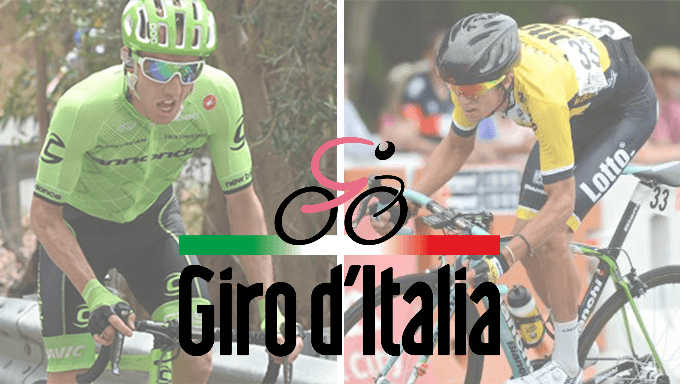 That Kiwi George Bennett is even set to line up at the Giro is remarkable – and the Kiwi can get the better of Canda’s runner turned climber over the next three weeks. Bennett was training for the stage 16-time trial near Trento and Rovereto with teammate Koen Bouwman when he was hit by a car and sent across the roof rack. Despite that, he rode fantastically in the Tour of the Alps to take fifth and he surely will improve plenty through the three weeks to take high rank. He was sixth previously in the Volta Ciclista a Catalunya when the only rider set to ride here that finished ahead of him was Simon Yates, and he was going beautifully at last year’s Tour de France when illness forced him to leave when just outside the top 10 and finishing strongly. He tried to recover at he Vuelta, but was still sick and wisely pulled out when over two hours down. Michael Woods, seventh at the Vuelta last year, is a prodigious talent who needs to be watched closely after his second in Liege-Bastogne-Liege. He will improve from that a good deal and is now going for the overall rather than just stages, but he does not have the benefit of a while team working for him and Bennett has finished ahead in four of the five-time trials the two have contested which could make the difference. You can get Bennett to beat Woods at 8/15 with Bet365. This is a chancey one given O’Connor is only 22 years old but the composure the Western Australian showed to take stage 3 of the Tour of the Alps to Merano with an impressive solo attack and afterwards, on the same circuit as the upcoming World Championships, he finished fifth in Innsbruck and ended up seventh overall, 1:33 down on overall winner Thibaut Pinot. His first grand tour is going to be a challenge and he’s on duty for Louis Mentijes but his sheer talent ought to be enough to get the better of Rodolfo Torres. O’Connor to beat Rodolfo Torres is 8/13 over at Bet365. Louis Mentijes needs to up his game ahead of this three-week campaign but he’ s done that plenty in the past and the South African impressed with his eighth in the Tour de France last year and then backed it up with a fine 12th at the Vuelta when he lasted better than many who decided to double that race up with the Tour. He was a constant presence in the mountain stages of the Tour and Vuelta, so the summit heavy route will be good news for him and other pure climbers here. Davide Formolo, tenth in the Giro last year, looks a prodigious talent and will give Bora Hansgrohe a fine stake in the race, and its understandable home advantage has made him the slightest of favourites here, but Mentijes’ superior experience might give him the edge here. If you fancy it, this bet is available at 2/3 with Sportnation. Movistar have taken a liberal approach to the Giro with their big four of Nairo Quintana, Mikel Landa, Alejandro Valverde and Marc Soler heading to the 2018 Tour, so a team of stage hunters and climbers has been assembled and two of them are faced off against eachother with Richard Carpaz looking like the right favourite to beat the Argentine Eduardo Sepulvelda. Carpaz impressed when 11th in this year’s Paris-Nice, no small feat given Marc Soler was the leader for the team and eventual winner whilst Sepulveda was 48th there. He caught the eye in Romandie, when 18th overall and posting a good effort in the uphill time trial, but he’s not caught fire for his new outfit yet and the Ecuadorian Carpaz makes much more appeal in this 4/7 match bet.